I love it when inspiration strikes me. It runs through my brain like a steady flow of electricity and gets me excited to put all of my energy into a project. Here are a few personal projects from my portfolio. 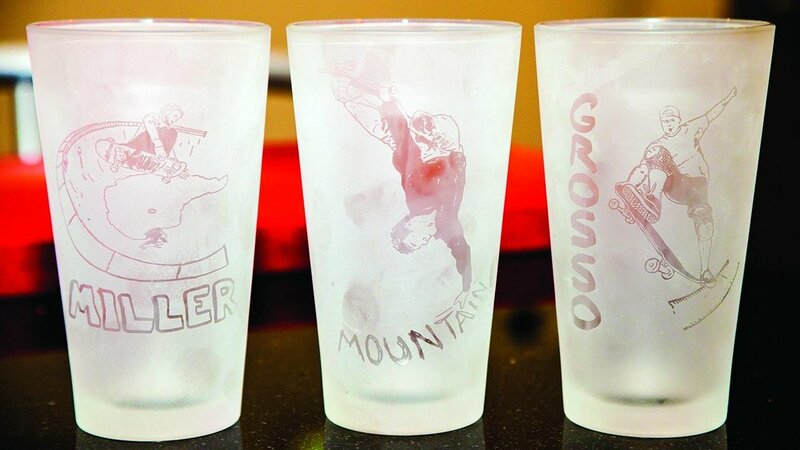 Skate Legends Pint Glasses featuring Professional Skateboarders Chris Miller, Lance Mountain & Jeff Grosso. Growing up I flipped through skate magazines for hours on end. This project combined my love of skateboarding, photography & illustration to create these etched pint glasses as a way for people to say cheers to their favorite inspiration on the board. Printmaking is a recent passion of mine. I discovered silkscreening and bookmaking early in my undergrad but I didn't discover woodcuts and linotypes until this past year. This project is a chronological documentation of my life since I discovered skateboarding in middle school. If when you hear the term "passion project" you think "little to no money" then you'd be 100% correct when it comes to starting a skateboard company from scratch with your friends. But hey, we're not in this to be millionaires...we're just content to be creating, having fun, and it gives us a pretty good excuse to go skate more (just don't tell our wives and girlfriends).